Since 2010, emerging markets have accounted for a larger share of global clean energy investment than the rest of the world. But from 2015 to 2016, these countries recorded their deepest year-on-year decline ever, in dollar terms. This analysis reviews clean energy financings in 106 emerging market nations and explores why capital flows appear to have slowed recently. 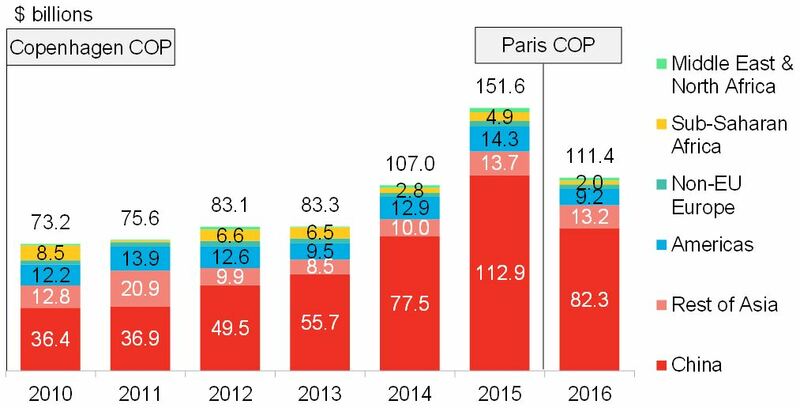 Total worldwide investment in clean energy recorded its largest year-on-year drop (in dollar terms) in 2016. But developing countries accounted for a disproportionate portion of the decline, with asset (project) financings there falling from $153.8 billion to $103 billion. China accounts for the lion’s share of clean energy asset finance in developing countries and attracted 63 percent of all such capital over the last decade. The country saw investment slip by $30.6 billion or 27 percent, 2015-2016. However, others saw steep declines as well. Excluding China, investment fell 30 percent in 2016 in the nations surveyed. Brazil, India, Turkey, Mexico and South Africa complete the top five emerging markets nations for clean energy and have attracted $270 billion since 2010. Despite large total volumes of capital deployed since 2010, a number of emerging markets have seen little to no investment. In any given year since 2010, no more than 27 developing countries have attracted over $100 million to build a single utility-scale wind or solar project. Thanks largely to China, the majority of total clean energy project finance in emerging market nations is provided by the countries themselves. The China Development Bank, state-owned enterprises, and private Chinese companies have all helped fund the build-out. Elsewhere in emerging markets, however, “international” (non-domestic) capital has played a critical role in scaling growth. No less than 36 percent of the funds deployed to the 106 emerging market countries in 2016 came from abroad (China excluded). Wealthier nations accounted for the majority of these international flows. However, after growing from $2.7 billion in 2007 to $13.5 billion in 2015, OECD-country funding suffered its largest year-on-year decline in 2016 to $10 billion. Funds awarded by development banks have stagnated at around $4 billion since 2014. Latin America has attracted the largest and steadiest flow of investment from overseas funders, topping $3 billion every year since 2010. The region has benefited from the use of tenders for clean power delivery contracts, which provide investors greater market certainty. The recent slowdown is potentially troubling news for policy-makers as it comes eight years after developed nations pledged to commit $100 billion annually by 2020 to lesser developed countries to address climate change. That promise was reiterated at Paris two years ago. However, there is little to suggest that long-term goal is near to being met. The data was collected as part of BNEF’s annual Climatescope project, a unique country-by-country assessment, interactive report and index that evaluates the progress made by emerging markets in their energy transition. Visit www.global-climatescope.org for the entire report.